Today, besides the Feastday of St. John of San Facundo, is the commemoration of Sts. Basilides, Cyrinus, Nabor, and Nazarius. These saints are yet another example to us of the life we are called to live as Christians. Namely, we are called to devote our entire lives to God and His Church. While many of us will never suffer death for the Faith, we must be willing to endure all things so long as we keep the Faith and reach Heaven. These saints, like so many others, help us put that into perspective in our lives in this modern world. 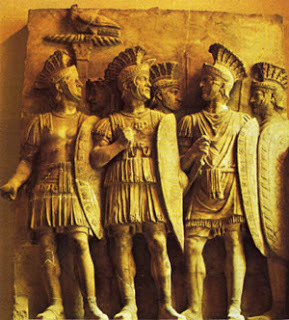 These saints, Roman soldiers, noble by birth and illustrious by their virtues, became Christians under Diocletian. Arrested and cast into prison, they were condemned to death and beheaded. Their bodies were thrown to the wild beasts who respected them; they were buried with honour by the Christians. They suffered and died for the faith around the year 303 AD. O Lord, may the keeping of this festival of the heavenly birthday of Thy holy martyrs, Basilides, Cyrinus, Nabor and Nazarius, shed brightness on our lives; and may the eternal glory granted them, be increased by the devout service we pay Thee.